Hire a licensed applicator to keep your trees healthy and flourishing. 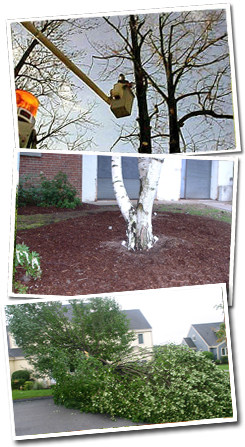 McKinney Landscaping Corporation is a landscaping company near Cortlandt Manor, New York, that specializes in tree care. We also provide complete landscape design and maintenance services. Without proper training, working in trees is dangerous and labor-intensive. Don't risk doing it yourself! Call us instead. All our tree work is overseen by a State and Local Licensed Professional, We are also fully insured for your protection. Our arbor crew will protect your investment and the beauty trees bring to every property. Our tree care services save you time, money, and hassle. Unfortunately Sometimes a tree needs to come down in order to keep your property safe. We take down dead or damaged trees and turn them into firewood, cutting wood into unsplit 24" lengths that we neatly stack at the base of the tree, splitting wood into firewood as well as recycling wood chips from brush into your landscape all available upon request. Tree stumps are unsightly and get in the way of new landscape features as well as acting as a tripping hazard. We offer stump grinding to completely grind stumps below grade, upon completion debris is removed, top spoil seed and shredded straw is is applied over the affected area. Storms can take down heavy branches or even entire trees. We offer 24-hour emergency service to help you remove fallen trees and ensure your property is safe after a storm. Call us any time for a fast response. We're here for you when disaster strikes.